New this year, employers on campus for the Career Fair will be invited to participate, so students may seek internships and potential job openings outside of the local area, in addition to research with faculty, major/minor/certificate programs, and community outreach and services, which are all important to enhancing graduate and undergraduate student education. STUDENTS: Mark your calendar and check back often for an updated list of participating employers, researchers, educators, and community leaders who will be eager to discuss their specific programs in energy, the environment, and sustainability studies with you at the Expo. 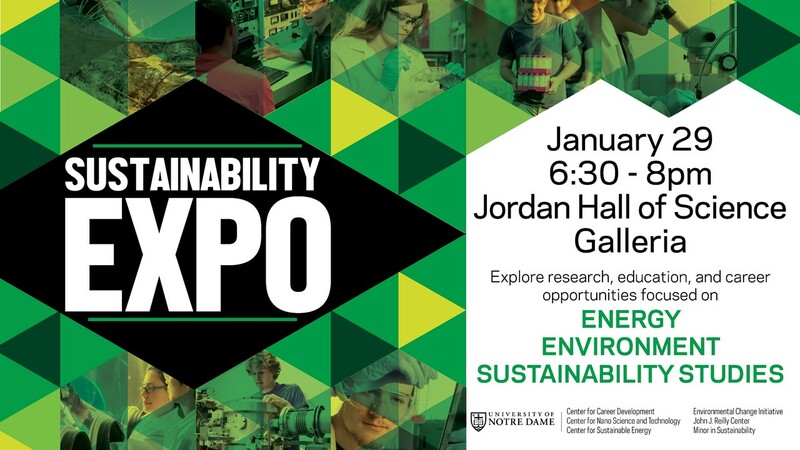 PARTICIPANTS: You should REGISTER HERE by January 18 to reserve your spot at the Expo, so you can have the unique opportunity to discuss your specific programs in energy, the environment, and sustainability studies with interested undergraduate and graduate students at Notre Dame. The 2019 Sustainability Expo is sponsored by the Center for Career Development, Center for Sustainable Energy at Notre Dame (ND Energy), Center for Nano Science and Technology (NDnano), Notre Dame Environmental Change Initiative (ND-ECI), Minor in Sustainability, and John J. Reilly Center for Science, Technology and Values. For questions, contact LoriAnn Edinborough, Career Development; Barbara Villarosa, Center for Sustainable Energy (ND Energy); Heidi Deethardt, Center for Nano Science and Technology (NDnano); Kara Primmer, Environmental Change Initiative (ND-ECI); Rachel Novick, Minor in Sustainability; and Anna Geltzer, Reilly Center for Science, Technology, and Values. To learn more, read the 2018 Expo recap.